Here you find an over 240 bilingual pages of audio-visual Modern Arabic language (MSA) resources ready to explore, to practice, and to learn from. Hundreds of Ready-to-learn from exercises and study materials students and teachers can enjoy. In this section you find Thirty Five lessons with easy to follow instructions. Each lesson comprises Five parts consisting of the Main titled lesson subject, vocabulary, explanations, practice page, and a Flash Cards window. You find under the Part 3 and the Extras tab buttons a pull down menu with a list of Arabic words you've studied in that lesson, select an Arabic word from the list to hear and practice the sound to enhance your pronunciation, and check the word translation to the right of the pull down list to get the meaning of it, as well as check the transliteration of the word in RED to the left of the pull down list. Click on the audio-visual "Flash Card" to begin memorization and to practice Speed Reading in Arabic. 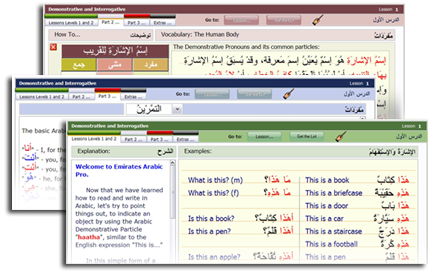 Point and click on each Arabic sentence, or click on the "Read" button you find at the bottom right of the screen to have the lesson read for you in Arabic with an icon pointing at each word.